When we arrived at a ger at dusk, we offered a few simple gifts. Like in many asian countries, offering and receiving something with both hands is a sign of respect. The left hand, considered impure, should never be used in such situations and especially not to eat. Thus, our small gifts (a bottle of "arkhi", mongolian vodka, a bar of soap, a lipstick, a pen and a notebook, and a postcard) were offered to our host or to the eldest person. The gifts were redistributed to the members of the family : the vodka (always shared with us later on) was left within easy reach, the lady received the bar of soap and the lipstick (which she would wear next morning when we took some photographs), and the kids were happy to start scribbling with the pen on the notebook. The postcard, a view typical from Mongolia, nothing unknown to them, nevertheless captured the attention of the whole family. It was then placed carefully on a frame, on the only one piece of furniture at the back of the ger, along with photos and other postcards.We regretted not having photographs or postcards from our respective countries to show them. While the tea was being prepared, we played dice or card games with our host and the kids, who were quick to learn the rules and eager to play. They also taught us a game with knuckle bones. Mongolian tea is not your usual cuppa. A handful of small twigs (rather than leaves) are boiled for a while in much water, then a laddle of milk (from cow, camel or goat) is added along with a pinch of salt (it's not so bad). The only one stove is dung fired (no wood around here) and cooking followed, inevitably mutton and rice, mutton and noodle, sometimes potatoes with mutton (fatty chunks rather than meat, as a sign of honour for us, boiled and served as a soup). Toasting with vodka was soon a well practice procedure. Bottles with capsules, once open, must be finished. Only one glass passes around. First, the host or the eldest person dips the right hand third finger in the glass, and throws a few drops in the air, "to the sky", a few to the ground, "to the earth", and a few towards the rest of us, "to the people". He or she the downs the vodka. The host fills the glass again and then passes it to each of us in turn, offering with the right hand, the left hand under the right elbow, and we receive the same way. It is impolite to refuse in Mongolia. When Roger proposed a cigarette to our host who did not smoke, he took one out of the pack, and then with a smile and a wave of the hand, put it back in. He did not refuse. We were offered once a bowl of "airag" (fermented mare's milk, a slightly alcoholic, slightly fizzy but very bitter product) from which each we took just a sip, leaving the son of our host to down the rest. I was in Mongolia at the beginning of October. The Gobi (see note 2) was still quite mild during the day but the steppe further north was already getting seriously cold, covered by a layer of snow 5 - 10 cm thick in some places. The ger, heated by the stove, was pleasant, but outside it was probably down to -10 deg after dusk. This did not stop the wife of our host to step outside in a T-shirt to pick up some dung for the fire. The ger being round, with the stove in the middle and sometimes two beds on either side near the wall, we had to work out which layout was best to fit the 6 of us (including the driver).This space is normally occupied by 4 or 5 members of the family. We lied down on the ground on thick sheep skins, wrapped in our sleeping bags and covered with more sheep skins by our considerate driver. Indeed, the fire was not always kept going all night. In the morning, breakfast (see dinner for the menu) was prepared by the wife of our host, while our driver was busy heating up the engine of the van with his scary kerosene blow-torch (also used to cook lunch on the road). We washed our faces rapidly in the freezing morning air with ice cold water. Toilets were about 50 m away in any direction, behind a few taller blades of grass (sometimes there was a hole in the ground, surrounded by a few planks to hide it a little). As we started our breakfast, the van accepted to start and our driver joined us with a triumphal smile on his face. We never left before taking some pictures, our hosts always proud to pose for us and with us in front of their ger, on their motorbike or on their horse. I have never seen people so happy to have photos taken. It will be difficult for reprints to reach them, but it is worth a try, since they will be so happy to receive some pictures. Then we were ready to set off. One of our stops was a little different. The lady was living with her grand-son only, as the rest of the family was away with the cattle (see note 3). Instead of a ger, she was living in a small hut, with ... a solar panel on the roof, a battery, therefore electricity and even a small TV set. In the morning, she asked us to take some photos of a painting with horses done by her late father. The colours were fading with time and she wanted a copy. As we were leaving, we caught through the fogged up windows of our van, a traditional and most beautiful gesture from her, as she threw a laddle of milk in our direction, as a sign of blessing. Note 1 : Pronounce "gair". 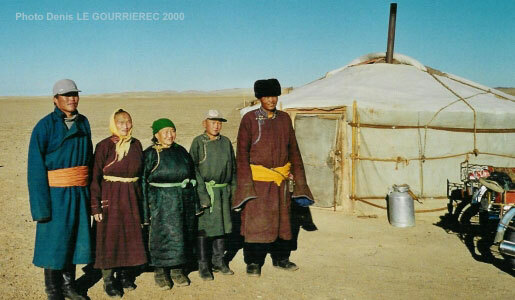 The word "yurt" was introduced by the russians and is not used by the Mongols, but by the Kirghiz and the Kazakhs. Note 3 : The steppe can accomodate cows, horses, sheeps and goats. 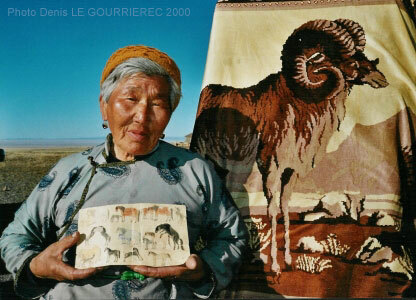 The Gobi, being more arid, is more suitable for camel, sheep and goats. Yaks are also reared in more mountainous areas. Cattle is protected from wildlife by huge and agressive dogs which sometimes chased our van as we drove past a ger or a herd.